(Newser) – Former Venezuelan Vice President Elias Jaua said today that he met with aging revolutionary icon Fidel Castro for five hours and showed the AP photos of the encounter, quashing persistent rumors that the former Cuban leader was on his deathbed or had suffered a massive stroke. Jaua also confirmed that the 86-year-old retired Cuban president personally accompanied him to the Hotel Nacional after their meeting yesterday, in which they talked about politics, history, culture and tourism. He was for 5 hours with that cretine bloodthirsty punk and didn't shoot him? 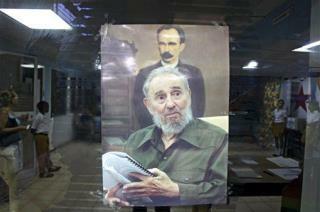 Oh well, maybe the CIA defends him as they did over 50 years... America's lil' darling, castrated castro.